In France, every year : 300 people lost their hands, 150 have protheses, 75 prefer an aesthetic prosthesis, 75 a myoelectric prosthesis (electric hand controlled by muscle sensors). Source : Touch Bionics. A myoelectric prosthesis is intended for people with hand disability to regain independence in their daily life (social, work , transport …). In France, these prostheses are provided by the social welfare. With the development of technology, new prosthesis appeared, improving movement of each finger and providing for better aesthetics. These poly-digital hands are not reimbursed and they cost « an arm », between 30 000 and 70 000 euros. The project aims to bring together a team around the world for the construction of a prosthetic upper limb at a low cost, due to standardized parts and open sources, easy to repair and therefore accessible to people with limited financial resources. This project does not compete with manufacturers of prostheses for countries with social security coverage or people with comfortable financial situations, but it wants to open new opportunities for emerging countries that do not have access to such equipment. The inertia of the project comes from the passion for technology and sharing knowledge, the desire to help others, and discontent in the world in which we live today (health for the benefit of profit). 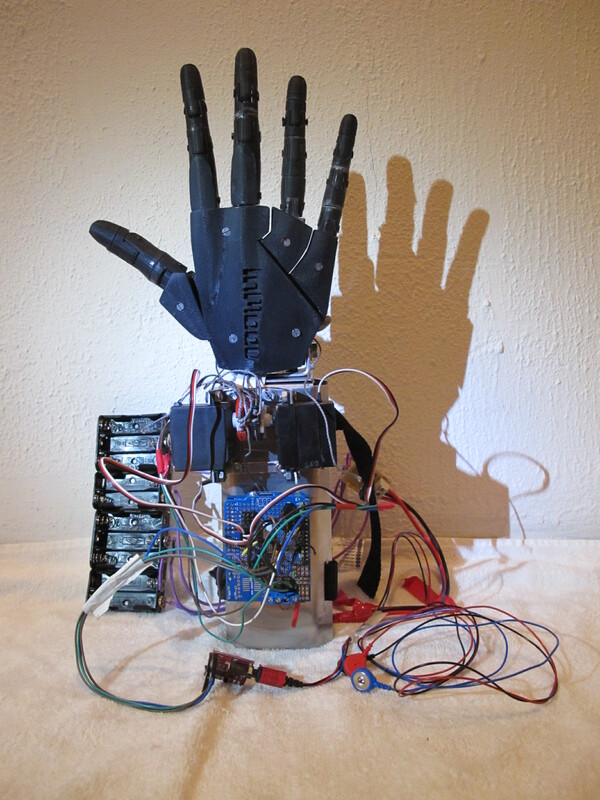 Since its inception in February 2013, Bionicohand project was rewarded twice at Maker Faire Rome which encourages and puts the project on the international level. It integrates the association My Human Kit created in February 2014, which gave it a legal status in order to obtain funds for research and collaborate with universities, research centers ect. The Team: About 10 people currently (disabled, engineers, teachers, students, job seekers , retired people etc.) LabFab Rennes, InMoov , Advancer Technology, Perron-Thortay Orthopedie. The project manager : Nicolas Huchet lives in Rennes and uses his myoelectric prosthesis every day. He had a work accident in April 2002 and lost his hand. He currently faces the problem of aquisition of a poly- finger prosthesis. 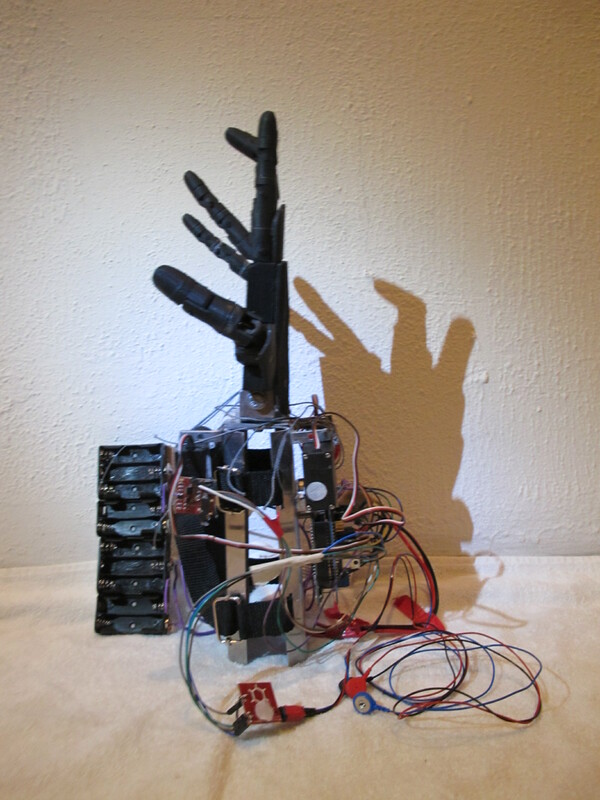 In October 2012, he discovered fablab in his city and asked whether it is possible to make a robot hand. When told about 3D printing and open sources ( arduino, Thingiverse, InMoov etc. ), he became aware of the possibilities that citizens have to change things and he decided to act. The 3rd prototype was presented in Moscow at the Geek picnic festival in January 2014. The hand is entirely 3D printed. 2 fishing lines are passed in each fingers, then connected to actuators that open and close the hand. The rotations of the actuators are controlled by muscle sensors placed on the muscle skin that will convert the muscle contraction to electricity. An electronic arduino board makes the link between all these elements. Power is generated by LR6 batteries. This prototype took : 35 hours for printing the hand, 15h for manufacturing (chassis), 6h for electronic wires, 6h for the arduino code, 3h for testing and 15 hours for thinking and tinkering . The costs are: € 8 for 3D parts (abs ), 20 € for the arduino card, 50 € for the muscle sensors, € 10 for batteries, € 35 for engines, € 5 for the chassis, 30 € for electrical wires, and electronic components. The socket was free. This labor was performed according to DIY (Do It Yourself), in a FabLab, a garage, a school. It was a hobby project realized beside work thanks to the skills and availibity of the people involved, no one has been paid . It does not constitute a durable solution for an amputee, it is a prototype robot hand, not a prosthesis yet. To achieve this, research should be directed towards robustness, miniaturization of components and the ability to grasp/hold objects.